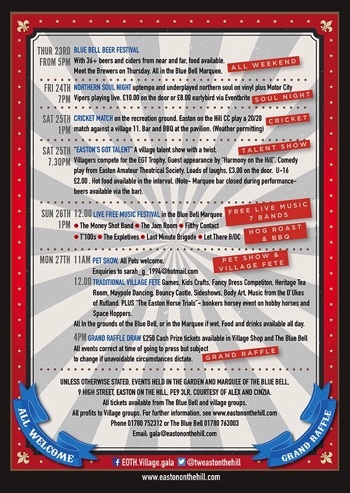 There's something for everyone across the weekend, and the village welcomes all visitors from near and far to come and share in the fun and fundraising. 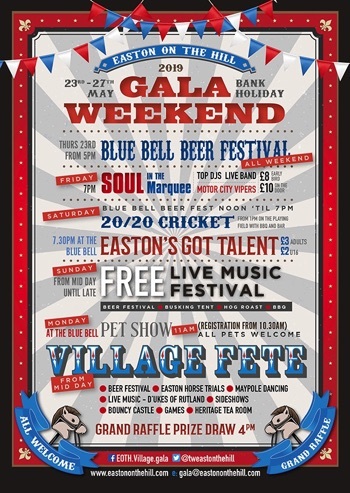 The proceeds from the Grand Raffle, The Traditional Village Fete, “Easton's Got Talent” and the Pet Show all go to support local village clubs and organisations and the organising committee aims to provide some great entertainment and fun in a traditional village pub setting. Innovations for this year include a barmy “Easton Horse Trials” event at the Monday Fete (expect hobby horses, space hoppers, and general lunacy) and a performance by EATS of “The Jewel of Lamjung” – a short play, as part of the “Easton's Got Talent” evening, which itself will have an Old Time Music Hall theme. 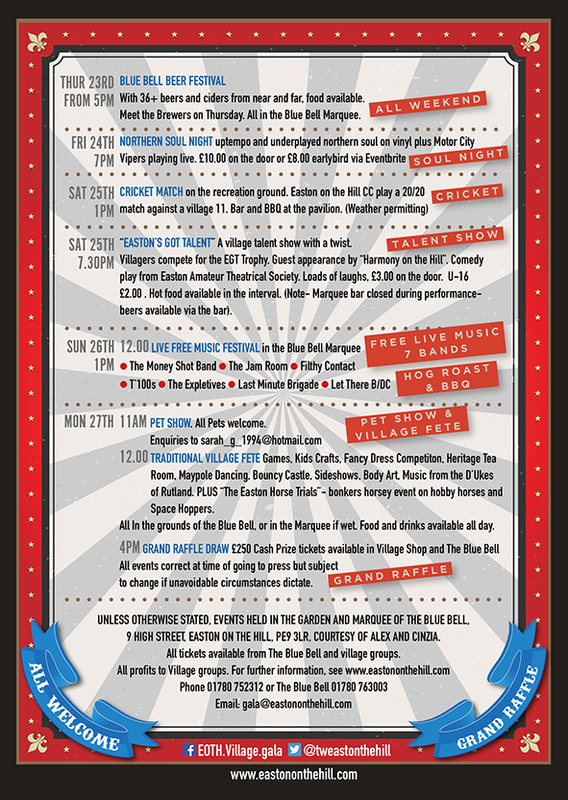 Sunday 26th May 12.00: All Day Free Music Festival with 7 bands: The Money Shot Band, The Jam Room, Filthy Contact, T'100s, The Expletives, Last Minute Brigade, Let There Be DC, plus acoustic stage. 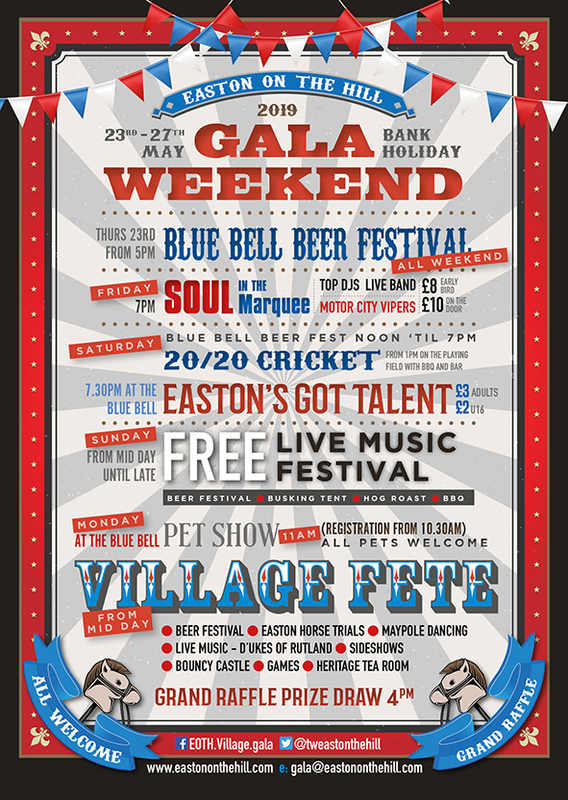 12.00: Traditional Village Fete, including “Easton Horse Trials”, children's crafts, heritage tea rooms, stalls, games, maypole dancing, music from the D'Ukes of Rutland and grand raffle draw at 4.00pm. As you will be aware, takings from the Gala weekend's village fete are ploughed back into village groups and we are delighted to say, that in 2018 there was a 73% increase in funds available for the groups' central pot! This very healthy increase on the previous year is due to more donations and sponsorship, as well as good raffle receipts and an excellent turnout due to the weather and packed programme. The bottle stall was also a huge success! !